These Matcha Hemp Energy Bites provides your muscles with the necessary fuel to keep going during a long endurance training. Mid-workout high-carb fuel can boost your performance and keep you going for longer. During your workout your body draws energy from your glycogen reserves but it also breaks them down. Glycogen is the collection of carbohydrates stored inside the liver and in your muscle cells. It easily converts into glucose which your body uses as an immediate source of energy. Mid-workout fuel needs to be packed with easily-digestible nutrients that provide energy and nourishment. 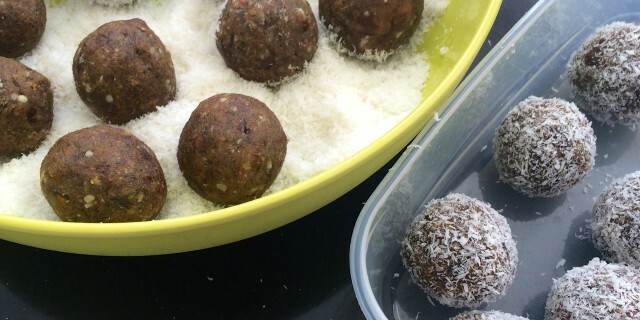 Simple sugars like coconut nectar and dates offer instant energy. When these simple sugars are combined with a source of protein and healthy fats like flax seed powder, hemp protein and coconut oil, they help release energy more slowly. Adding protein and a little healthy fat slows down the break down of sugars and causes energy to be released more slowly into your bloodstream. This is great for longer rides or runs when you need to sustain your energy levels. These Matcha Hemp Energy Bites also contain electrolytes in the form of sea salt. Make sure to consume a small bites every hour during a long training (>1,5 hour) to get best results! Add all ingredients to a food processor, except for the coconut flakes, and mix well. You can also use your hands. If you want to make balls, then you need to make little balls with your hands and roll them into the grated coconut. You can also choose a faster option and make Recovery Bars. Simply line a small square baking tray with baking paper and add in the mixture. Smooth it out until you have your desired thickness. Sprinkle the grated coconut on top and, using your hands, press the coconut into the mixture so it’s no longer loose. Place baking tray in the freezer. When solid (they won’t freeze rock solid), cut into bars. You can use cling film to individually wrap them and take them on the go.